In my DWF Markup Sets – Part 1 post we explored just how one would go about creating a DWF Markup Set. Creating a DWF of the sheet(s) we would like to markup was of course the first step required in fully utilizing the Design Review technology. Frankly, the technical part of creating and using DWF Markup Sets is mostly done within AutoCAD. The Design Review software itself is rather straight forward and easy to use. With our DWF file created (Part 1), we will begin looking at how to actually create some “redlines” or markups. Before moving on, be sure you have downloaded and installed Design Review from the Autodesk Website. Do note a Service Pack is available for Design Review 2007. The service pack fixes a few issues including a compatibility issue with Microsoft Internet Explorer 7. Without Service Pack 1 installed, the File, Edit, etc menus at the top of the screen will disappear if you have Internet Explorer 7 installed. First things first, we will go ahead and open the DWF file we created from the DWF Markup Sets – Part 1. As stated in that post, a DWF is very similar to a PDF, except that a DWF has some additional functionality with regards to AutoCAD and other Autodesk products. Design Review harnesses this additional functionality with its ability to create markups electronically, saving everyone money. The interface may seem a little intimidating at first, but rest assured it’s quite simple to navigate once pointed in the right direction. Those familiar with AutoCAD’s middle mouse button functionality should feel right at home within the Design Review program. Zooming in your drawing can be achieved using the scroll wheel on your mouse. Basically scrolling up will zoom into your drawing, and scrolling down will zoom out of your drawing. Likewise, pressing and holding the middle button will allow you to “pan” around in your drawing. These two functions copy AutoCAD’s middle mouse button functionality perfectly. The one exception to Design Review’s middle mouse button functionality when compared to AutoCAD is double-clicking the middle button. AutoCAD users likely know double-clicking the middle button will allow you to zoom to the extents of your drawing. Unfortunately double-clicking the middle mouse button in Design Review does absolutely nothing. If you’re not so much a middle mouse button person, no fear Design Review provides us a number of toolbar buttons which will allow us to navigate our DWF as well. The three primary drawing navigation functions, select, pan, & zoom, are contained within 5 toolbar buttons. Working from left to right, the first toolbar button is “Select”. Do note the select function in Design Review will only select Design Review entities; markups. You cannot select a line from your AutoCAD drawing, but you can select a previously created markup object. We will take a look at markup objects in a moment, but onto looking at the other drawing navigation buttons. The second toolbar button is for “Pan”. If you are an AutoCAD user you’re likely a compulsive Esc key presser. Pressing the Esc key in Design Review does not do anything. So unlike AutoCAD if you press the Esc key after panning to a new location in your DWF drawing, you will remain in the pan command. Finally Design Review provides us with 3 zoom toolbar buttons. The first, illustrated with a “+/-“, will allow you to simply zoom in or out of your drawing. Clicking and moving your mouse towards the top of your screen will zoom in, and moving towards the bottom will obviously zoom out. Next we have a “Zoom Rectangle” button. Again, for AutoCAD users this is essentially the zoom window command. Finally, if you want to zoom out to see the entire drawing you can use the Zoom Extents button. While the functionality of the buttons is likely pretty self explanatory, tooltips are provided for each of the toolbar buttons. Simply hover over any toolbar button and a little yellow box will appear below your cursor. In addition to a quick hint as to what a particular button does, many toolbar buttons have a single letter contained inside of a parenthesis. For example the “Select” button shows an “(A)” in its tooltip. What this is telling us is the shortcut key you can press to activate that button. Thus in the case of select I could press the [A} key on my keyboard to use the select command in Design Review. Again, this is very similar to shortcut keys in AutoCAD with the exception you do not have to press enter to make the system take the command. 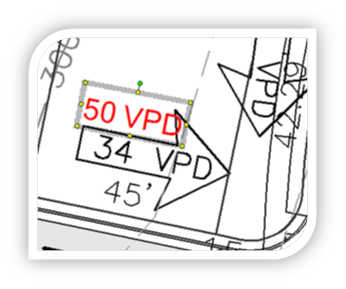 Design Review provides us with a number of ways to create markups, or “redline” a drawing. Before we begin its important to understand that each markup item we create will be treated as a separate comment. More specifically if you draw a line, and then insert a piece of text to accompany it, Design Review and AutoCAD treat that as two comments. For that reason I traditionally opt for the “Callout Tool” as opposed to the text or shape tools. Do note that Design Review only has the ability to create markup objects. 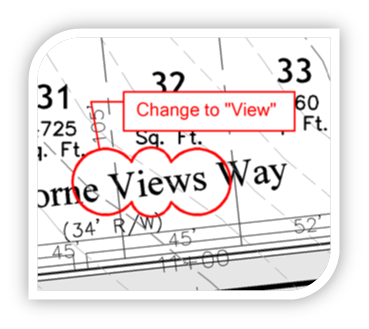 A markup object is not automatically inserted or included in the original DWG file. It will be up to the draftsperson to read your notes, and make the appropriate changes. Without any further adieu we will begin looking at how to use each of the markup tools. Text Tool â€“ The Text Tool allows for us to insert a piece of text into our drawing as a markup object. Simply press the button, select a insertion point for your text, and finally type whatever you would like. In the example below I have indicated for the VPD (Vehicles Per Day) count be updated from 34 to 50. Selecting on a piece of markup text will allow you to reposition it and rotate it. Shape Tools â€“ Design Review allows for a number of basic shapes be drawn. The default is a standard line, but we are also given the option to draw polylines, rectangles, circles, and finally a freehand tool. The freehand tool allows you to draw using your mouse like a pen/pencil. Illustrated below is a standard line drawn as a markup object. 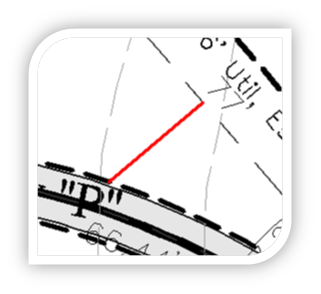 I may use the line markup object in this case to illustrate the approximate location of a new easement or setback line. Callout Tools â€“ As with the Shape Tools, Design Review provides a fair number of what it calls “Callout Tools”. Personally I find the Callout Tools to be the most useful, and default to them most of the time. Quite simply the Callout Tools draws a revision cloud with some sort of text box attached to it. Which revision cloud / text box combination you choose will of course hinge on the type of markups you are creating. Getting away from marking up drawings with a red pencil may take some getting used to for many, but in the end Design Review can truly save money in more ways than one. There is the obvious savings with large format plots â€“ which aren’t the cheapest thing to create. But soon other costs will be reduced if not eliminated. Of the crafts nearly made extinct from the evolution of CAD has been hand lettering. Consequently the handwriting of many engineers rivals the handwriting of doctors. The domino effect here is drafters many times needing to ask for clarification on certain items. Using Design Review, everything is typed, and thus (short of the occasional typo) there’s never any question to the engineers intent. Translation â€“ less interruptions means more efficiency for drafters. In my next post I will look at bringing these markups into AutoCAD. With only a few clicks your Design Review Markups can be superimposed onto your sheets. Suddenly drafters no longer have to shift their focus to a set of drawings sitting on their desk to their AutoCAD screen. Using markup sets, a drafter can simply keep their focus on the screen, translating into better accuracy among drafters.